Whilst you can’t necessarily win the overall title or your league title in the first few weeks of the season, it would be good, for once, to not be 15,000th after round 6 and forced to spend the rest of the year battling back to a respectable finish. STOP what you are doing right now and read on. The table below shows the average finishing position of the teams from 2018 that each side will face over first 11 games of the season. For example in the first six weeks the Cowboys opponents (Dragons, Broncos, Sharks, Raiders, Storm, Warriors) finished an average of sixth last year, whilst the teams that the Warriors play (Bulldogs, Wests, Sea Eagles, Titans, Rabbitohs, Cowboys) finished an average of just over tenth last year. 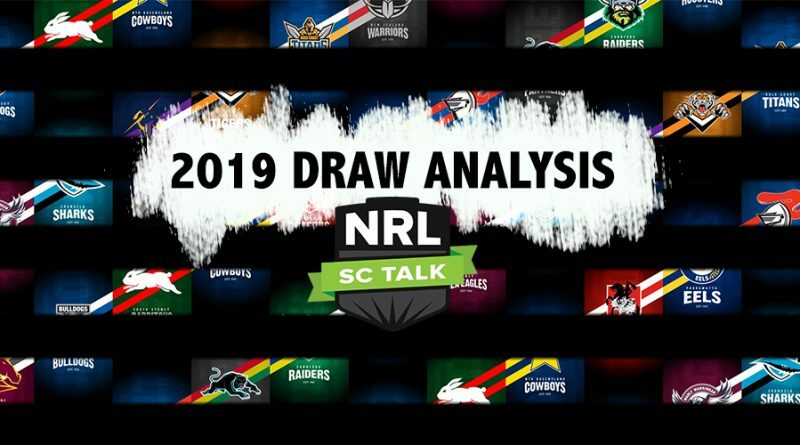 From the above you can see that the Cowboys, Sea Eagles, Broncos and Titans have the toughest start to the season, so it might pay to avoid attacking players from those sides in your round 1 line-up’s. Take Jamayne Issako for example: Although three of the Broncos first six games are at home (Cowboys, Dragons and the Tigers), they play the Storm and the Roosters away in rounds 1 and 4 respectively, which you would expect to be tough matchups for the likes of Issako. They also play the Roosters again in round 10. On the other hand, players from the Warriors, Tigers and Raiders have a nice start to the year. Jack Wighton, BJ Leilua and Joseph Tapine for example have home games in Rounds 3 and 5 against the Knights and the Eels as well as away games against the Titans and the Cowboys. These attacking players from the Raiders could very well get off to a fast start in 2019. The analysis for this part of the season is the same as the first six weeks; you can see from the table above where the advantages and disadvantages lie – and more often than not it is the opposite of the first six weeks. The Tigers draw during this stretch is very difficult (Roosters, Panthers, Storm and the Rabbitohs in consecutive weeks), whilst for the Titans and Cowboys it gets considerably easier following a tough start to the year. Hopefully this is the time of the year when those players who had a tough draw to start the year have fallen in price and you can snap them up at a discount leading into the soft part of their schedule. Here’s what you’ve been waiting for, right? Some teams will also start the year well and then fade away, or vice-versa. Whilst I think it is another good tool to use to assess your Round 1 side, you should be using it in conjunction with all your other pre-season research. That’s it for now. What are your thoughts on the early draw? Stats, beautiful stats! Excellent analysis and food for thought. I’ll be coming back to this many times in the coming weeks. Great write-up mate. Although I’m not convinced with Turbo that he will slump early, he averages 80 against the roosters who will be coming off a premiership hangover, the rabbits have a new coach and potentially some debutants in the backs. The dragons by the sound of things are also going to line-up with Lomax and potentially a new winger on the same side. I think he will still tear up a few teams. The stars seem to perform no matter what, so you have a good point. Good stuff @3 – Welcome back! It’s a very valid point and one which I utilised last year. Often a difficult draw is a bonus for middle forwards as they are likely to get through more work. I like the Cowboys draw to start the season: they play their first five games in Qld, and they’ve spent the majority of the preseason training in that heat, whereas other teams haven’t. This will only favour their outside backs and halves. I’m expecting them to put up big scores in the early rounds. I don’t think their draw could have gotten any easier with the heat they have been training in. They verse two coastal teams (dragons, sharks), Warriors (don’t know how hot it is over there), Melbourne, Brisbane and Raiders from the ACT. No Sydney teams, who have probably been training in the same heat as the cowboys. They might score 90% of their points in the last 5 minutes when the opposition is buggered. Probably the humidity will be more a factor: Cows play 3 night games, 2 games at 4.30pm and 1 at 5.30pm in their first 6 games. Tigers were supercoach killers last year though. Was that due to cleary’s coaching ? It was the constant chopping and changing in the team that was the killer. Cleary was busy trying to bring discipline into the side and was dropping people for fun. Cant see the same inconsistency with Madge at the helm. Yeah felt that first hand with Nofo I was more referring to the teams that they were playing though. They seemed pretty tough for everyone to score against, especially the first half of the year. Nice article mate. I usually dont bother looking at matchups initially and try and get as many guns in as possible. However, this has given me some food for thought. Morgan a stay away due to this early draw? May pick him up in a few weeks for a similar price?